Jonathan Newell finds out from LCR Embedded Systems how they provide RFI immunity to marine electronic systems in very harsh environments. A military sea-going vessel represents one of the most punishing environments for electronic systems so housing such systems is a vital design element to ensure the contents are protected from mechanical shock and vibration as well as having immunity to RF emissions. One company, LCR Embedded Systems, has stepped up to the mark to custom design housings for shipboard use that provide the electrical and mechanical protection as defined by stringent US military standards. These chassis have the advantage of being able to be mounted directly to the vessel’s hull and can be used on multiple ship deck levels. 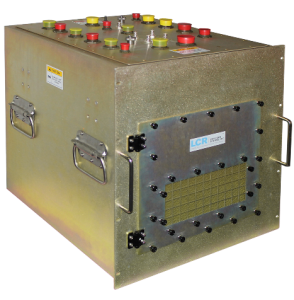 The generic, customisable system that LCR has produced is the Rugged Shock-Isolated Chassis (RSIC-08) for shipboard bulkhead mounting. The chassis features an innovative, customisable, multi-point isolation system designed and produced by LCR Embedded, and may be used on multiple deck levels and to support multiple applications. The chassis has passed the Deck Simulator Shock Machine (DSSM) test for compliance with MIL-S-901D as well as MIL-STD-167A (vibration) and has been designed to meet MIL-STD-461 (EMI/EMC). The chassis is cooled via forced air, with backplane and fan power isolated from one another. Close attention was paid to EMI performance, which was made possible by a welded, dip-brazed, gasketed construction with honeycomb air intake and exhaust. The front door of the housing is fitted with an EMI gasket as well as an EMC compliant replaceable honeycomb dust filter. The top face mounted removable and customisable I/O panel is similarly protected from Electromagnetic Interference with a suitable gasket. An EMI honeycomb filter is also fitted to the rear exhaust, providing the final seal against RF noise. The chassis is very flexible and its unloaded weight is approximately 34kg with suitability for a range of payload weights from approximately 7 to 20kg. LCR Embedded Systems believes that customisation and flexibility is key to success in such demanding environments and most of the company’s production is at least customised to some extent, sometimes even completely customised. According to the company, apart from the basic chassis design, clients often have specific needs regarding backplane changes, slot count, form factor or other configuration specifics. The chassis was initially created with a VME backplane, but VPX and CompactPCI backplanes are an option, as well as customisable shock isolation for variable weight payloads. While the current chassis supports 8 slots, the chassis capacity can be customized where needed. LCR Embedded Systems President, David Pearson, elaborated on this by explaining that originally, the chassis was created in response to an urgent customer request after a previous supplier was unable to meet their extreme shock and vibration requirements. “Our engineering team really stepped up and was able to create a universal chassis suitable for direct hull mounting on multiple deck levels and that could pass some of the most punishing shock and vibe tests ever imagined. Not only was our original customer thrilled with the results, but we’re equally thrilled to offer this design to all of our customers,” he explains.